One of the boys I babysit is 3 years old and really enjoys our walks each day. Unfortunately, he also falls more than any child I have ever looked after, mostly because he is constantly turning around to look behind him while still walking (or running) forwards. I have lost count of the times I have said, "Silas, you have to turn around and watch where you're going," or ""Silas, turn around!" His mother tells me she is constantly saying it, too, but it doesn't seem to have sunk in yet. One morning early last week, after he had already fallen twice on this particular walk, he was again looking backwards while walking forwards and I said for the umpteenth time, "You need to turn around and watch where you're going or you're going to fall again!" Immediately I thought, "There's a devotion right there." As I kept thinking about it, though, I realized there's not just one devotion in that sentence, but two. This week we'll look at the danger of looking backwards and next week, for part 2, we'll look at the necessity of looking forwards. Paul wrote to the Philippians, "I don’t mean to say that I have already achieved these things or that I have already reached perfection. But I press on to possess that perfection for which Christ Jesus first possessed me. No, dear brothers and sisters, I have not achieved it, but I focus on this one thing: Forgetting the past and looking forward to what lies ahead, I press on to reach the end of the race and receive the heavenly prize for which God, through Christ Jesus, is calling us" (Philippians 3:13,14). In the verses leading up to this, Paul had detailed all of the things that made him seem like a righteous Jew - his circumcision, his lineage, his dedication to the Law and even his persecution of the church. Sometimes we, like Paul, look back at our lives and see the good things we've done and maybe we believe that we are more worthy because of those things. But then Paul said, "I once thought these things were valuable, but now I consider them worthless because of what Christ has done" (v. 7). All of those things in his past were worthless compared to the salvation Christ offers because they could never have given him eternal life. And the good things in our past are worthless for the same reason. "God saved you by his grace when you believed. And you can’t take credit for this; it is a gift from God. Salvation is not a reward for the good things we have done, so none of us can boast about it" (Ephesians 2:8,9). In Philippians, Paul was saying we have to stop looking back at the good things we've done and tallying them up as if they can do us some good. They can't. It's only faith in Jesus that gives salvation, so turn around and focus on following Him. Of course, some people don't have a past of righteousness to look back on as Paul did. They have a past littered with sin and they look back at it with shame. Their problem isn't that they're looking back at the past and thinking it does them good; they look back on their past and feel like it's dragging them down and pulling them away from God. Truth be told, no matter who we are, we all have moments like that, don't we? But what a beautiful thing is written in Romans, "So now there is no condemnation for those who belong to Christ Jesus" (Romans 8:1)! No condemnation! None! It doesn't matter what is in our past, if we believe in Jesus as our Savior then God holds no condemnation for us for any of it. Isn't that amazing? Those old sins hold no power over us anymore. "And because you belong to him, the power of the life-giving Spirit has freed you from the power of sin that leads to death" (Romans 8:2). We can stop looking back and feeling like those things are keeping us from God. They're not. Through faith in Jesus we are free to turn around and follow Him, leaving all of those things behind us. Whether we've been looking back at our past with pride or with shame, God is telling us to turn around. 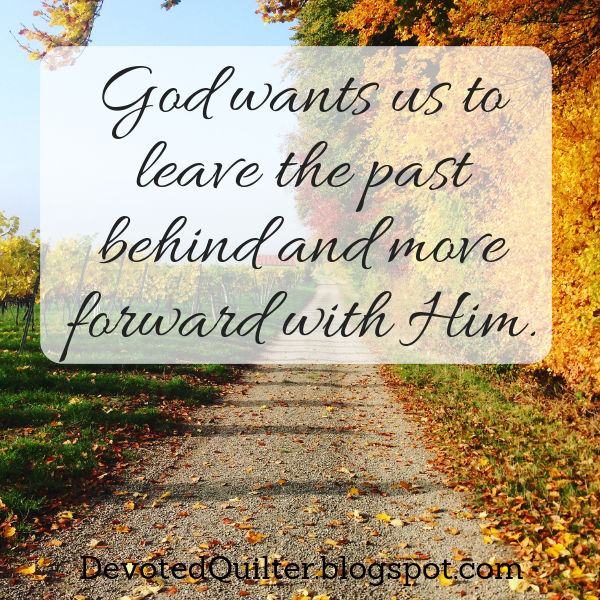 Leave the past behind and move forward with Him, pressing on, as Paul said, towards the end of the race. I am guilty of this looking back and it does weigh down on me the present. Another good thought provoking post. Repeatedly falling down because of looking back. What a great illustration - well! not so great for little Silas - but hopefully he'll learn same as we all should!